If you’re expecting your financial situation to change for the better this year, you’re in good company. 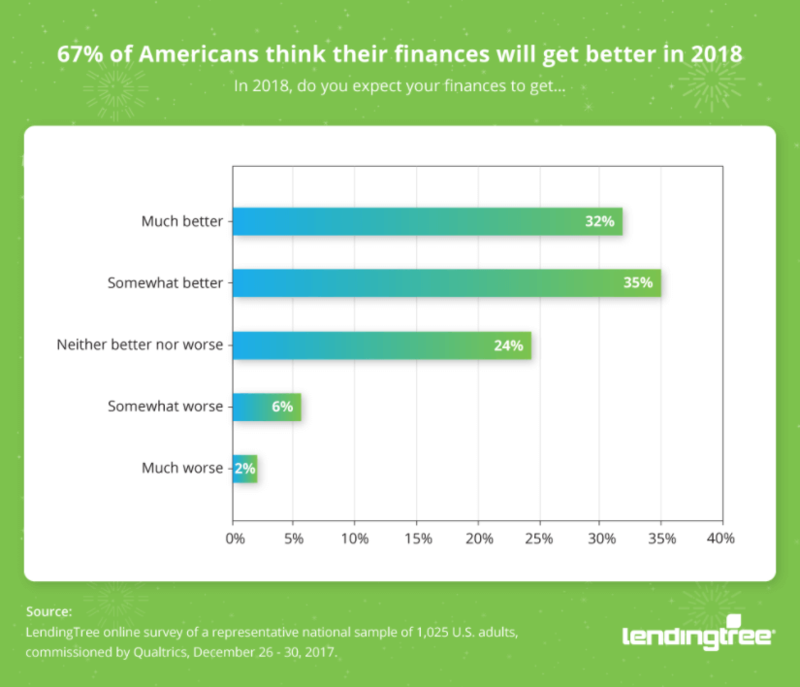 In a survey conducted in December, LendingTree, a leading online loan marketplace, found that 67 percent of Americans expect their finances to improve in 2018. RewardExpert recently spoke with Lending Tree’s Vice President of Research, Brian Karimzad, about the survey results. 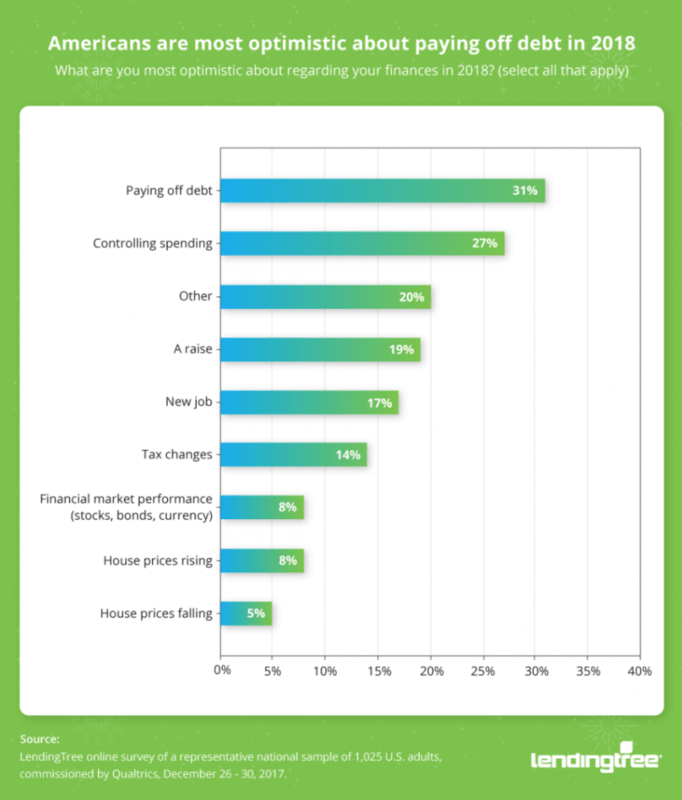 Of the more than 1,000 consumers who responded to the survey, 32 percent said they expect their finances will get much better this year, while another 35 percent expect them to get somewhat better. Only 8 percent expect their financial situation to worsen. What’s the source of their optimism? The cause is likely last year’s economic track record, according to Karimzad. The survey also revealed that most Americans still have some financial concerns. In fact, only 5 percent stated that they are financially worry-free. The most common concerns identified by respondents included unexpected expenses (43 percent), making ends meet (34 percent) and healthcare costs (29 percent). 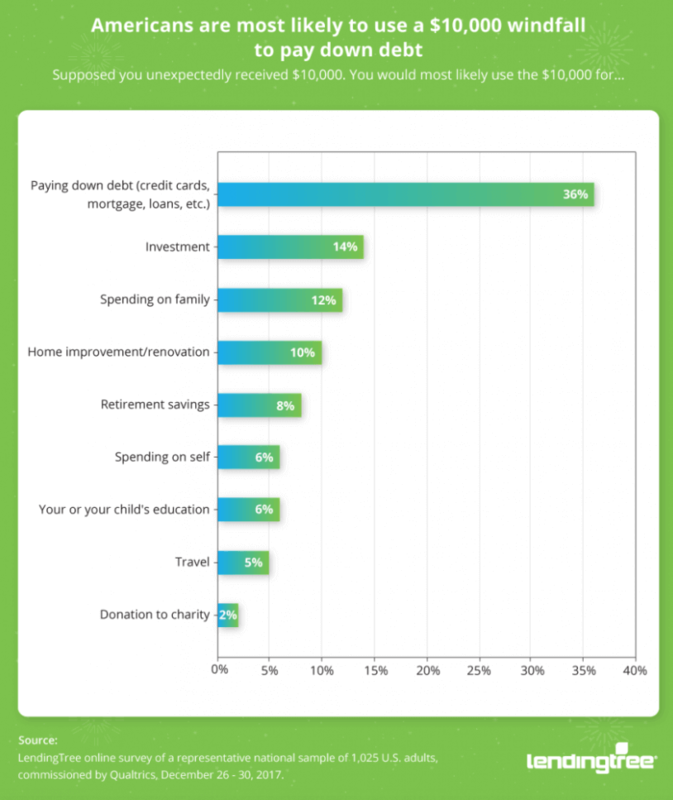 The LendingTree survey also found that debt is a major financial focus for many Americans this year. When asked what they’d do if they received a $10,000 windfall, 36 percent of the survey respondents stated that paying down debt would be their top priority. In fact, debt repayment was a significantly more common choice than investing (14 percent), spending on family (12 percent), home improvement (10 percent) and saving for retirement (8 percent). Additionally, the survey results showed that 31 percent of Americans are most optimistic about paying down debt in 2018. Other sources of optimism included controlling spending (27 percent), receiving a raise (19 percent), and getting a new job (17 percent). Karimzad said the optimism from the survey respondents is encouraging. “I think it shows that people are really motivated and willing to buckle down and make a few sacrifices to lower their interest payments,” he said. While paying down debt is important, so is saving for unexpected expenses. Though the LendingTree survey revealed that 95 percent of Americans are reviewing their finances at least once a month, and as often as every day for nearly a third (30%), studies have found that the majority don’t have enough savings to cover even a $500 emergency. After paying bills and covering other basic living expenses, Karimzad said too many people see the money remaining in their bank account as a reason to splurge. He suggests examining your budget, setting a savings goal, looking for areas where you can trim your expenses, such as interest on revolving and other debt, and allocating more of your paycheck upfront to emergency savings. To learn more about LendingTree and its network of over 500 lenders offering home loans, personal loans, credit cards, student loans, business loans, home equity loans/lines of credit, auto loans and more, visit www.lendingtree.com.